You know, I’ve never liked country music. Growing up listening to hard rock and classic rock on my dad’s car radio, I developed my musical tastes. Later, much to papa’s chagrin, I got into the thrashier and darker metal acts, as well as dabbling in the type of rap that I could dance (badly) to. While we don’t agree on his Bob Seger and Lynyrd Skynyrd, or my Sevendust and Disturbed, we find common ground on Aerosmith and Pearl Jam. But yet, despite my varied tastes in music, I could never learn to love country. I’m definitely in the minority here, as country music has grown in popularity considerably. Acts like Rascal Flatts, Big ‘n Rich, and Taylor Swift are among those who have fused the genre with modern hard rock and pop music, mainstreaming it to reach a wider audience. It still astounds me that I live in a place where Philadelphia is 45 minutes away from me on one side, Atlantic City 45 minutes the other way, and yet, at times, I feel like I live in the midst of a bad Jeff Foxworthy sketch Though, with country music gaining steam, it makes sense for performers to reach out or cross over into the genre. I’m not talking about just other artists, though. I’m also referring to professional wrestlers as well. The news recently broke that Mickie James, five time holder of WWE’s Womens/Divas championships, and one of the most popular women’s wrestlers in recent memory, has signed on with a Nashville-based talent agency, taking steps toward becoming a country singer. Now, it’d be hasty to jump to conclusions and think that Mickie would be leaving WWE as a result of this decision. After all, many WWE performers do work in movies and music while still fulfilling their contractual obligations in wrestling. Perhaps it’s the fact that this is an outside agency, one not under Vince McMahon’s lock and key, that makes it seem as though her WWE run could be nearing its end. What am I to make of this? Ever since she debuted on Raw four years ago, Mickie’s been one of my favorite divas. Even then, back when she performed in TNA under her former ring name of Alexis Laree, I liked what she had to offer. It was, however, her “Single White Female” storyline with Trish Stratus that catapulted her to stardom. Never before had WWE booked a storyline with two women that featured such character depth, especially from Mickie, who was still freshly new to the promotion. It was must-see TV, watching Mickie James play a crazed stalker with lesbian tendencies, obsessing with Trish Stratus and her every move. When that story run ended, and Mickie meandered into playing a babyface (mostly due to the residual crowd support from seeing someone, ANYONE, have character depth and motivation), her popularity remained. It also helps that she’s a beautiful woman, with a compact body, enthusiastic eyes, curves in places that could be appreciated by any man, and ravenous brown hair. That’s not to mention that she’s one hell of a hand inside the ring. While WWE has a history of shallowly promoting women solely based on their appearance in lieu of substance, it was great to see Mickie James perform at a high level from her years of experience on the independent scene. You’d think with this level of appreciation, that I’d be sad to see Mickie go. Seriously, what’s the point of being in wrestling anymore if you’re Mickie James? In a ten year career, she’s already reached the perceived pinnacle numerous times. She’s thirty years old, which is how old Trish Stratus was when she walked away in 2006. I find it hard to believe that some people are bashing her for wanting to go on a new career path, especially one that’s going to bring her happiness. You know, maybe they’re onto something. How dare Mickie want to work for a company that doesn’t seem to grasp her popularity! I mean, how many times has she had to lay down and take the fall from some Hawaiian tropic model, fitness model, lingerie catalog model, and outright internet skank, in attempt to transfer some crowd heat onto a woman that doesn’t have one fifth of the natural personality and charisma that Mickie has? I can’t imagine why she wouldn’t want to stay around! Once Trish Stratus and Lita both walked out the Stamford palace in 2006, in terms of women who could wrestle, show personality, and look beautiful, you had Mickie and….umm….well, Mickie. Oh, you also had Victoria, who was relegated to demented heel comedy act, probably because she was in her mid-thirties. After all, there isn’t a woman on the planet 35 or older that a man wouldn’t give anything to lay down with. Except Marisa Tomei, Brooke Burke, Teri Hatcher, Salma Hayek, Jennifer Lopez, Monica Belluci, Alyssa Milano….umm, actually, there’s LOTS of hot women over 35. But still, since WWE wasn’t content on pushing Victoria (who has gone on to TNA, where she is still quite beautiful at 38), you had Mickie. Her only real counter-part was Melina, a veteran of the California indie scene who possesses beauty, skill, and a personality as well. But otherwise, the women’s roster at that point in time was a bevy of talentless ‘promotional models’ (business slang for: professional hookers) that included teacher-turned-succubus Michelle McCool, annoyingly overrated Go Daddy bimbo Candice Michelle, hot-but-useless Miami Heat dancer Layla, veteran fitness model Torrie Wilson, reality show veteran Maria (who actually tried and tried hard, to her credit), and everyone’s favorite sink-pisser Kelly Kelly. All of this capped off by Diva-search winner, the punk poser princess herself, Ashley Massaro, who became famous for being more brittle than an icicle, as well as leaving wrestling to care for a daughter she doesn’t have. Odd indeed. You’d think with such a thin roster of mostly talentless hacks that Mickie James would be crowned the Queen until some real competition came along, but you would be wrong. Instead, Mickie was pushed aside as canon fodder, while the likes of Candice, the somewhat talented Beth Phoenix (though dull, and manly to the point where fans can’t be bothered with her), and others leapfrogged her. McCool and Kelly were pushed hard, due to the WWE’s dogma that they, as thin blondes, are more marketable than, say, a 5’4″, athletically built dynamo such as Mickie. If I’m Mickie, I take this very personally. She can’t grow to be 5’7″ without some sort of revolutionary medical procedure. She’s never going to look like Hollywood’s vision of how a woman should look. So she’s stuck, being this short, thick-thighed woman, who is apparently not marketable to the fans. Ah, but the fans DO like her, as evidenced by the Cyber Sunday pay per view events, in which the divas were shoehorned into costume contests, since the event was near Halloween, for the fans at home to vote on. Mickie won both contests in 2007 and 2008, as an Indian princess and Lara Croft respectively. She won convincingly both times, proving that there’s a large segment of the audience that will see a woman in thick black booty-shorts, black leather boots, matching halter top, and nearly die of lust. Thank god my dog knows CPR. All kidding aside, it’s baffling as to why WWE doesn’t seem to put its entire faith in her as the face of the women’s division. Instead, we see Kelly Kelly dominate commercials as the marquee diva. Kelly is blonde, stick thin, and was hired by WWE when talent coordinator John Laurinitis found her in a clothing catalog. No, really. Also, WWE puts a lot of stock in Michelle McCool, who doesn’t interest fans, and has allegedly alienated a lot of her fellow divas backstage with an apparent stuck-up attitude. Since it’s common knowledge that she’s in a relationship with the Undertaker, the push isn’t so far-fetched. Add on to this the dictum of bringing in more divas with no wrestling background to the current mix, and it’s easy to see why Mickie seems to be on the verge of making a break for it. There’s the Bella Twins (beautiful, but do NOTHING), Eve Torres (much like the Bellas, except there’s only one of her), Maryse (decent, but only got her WWE gig after trying out for the Diva Search with no prior background), and Tiffany (who is portrayed at the incompetent general manager of ECW, and apparently doesn’t have a last name. It’s like Sade running SmackDown). An interesting side effect of all of this is the message it sends to young female fans. If you’re a girl who’s 15 or 16 years old, loves wrestling, and dreams of one day becoming a diva in WWE, then you have to take a look in the mirror. If you’re under 5’5″ and have chubby (albeit athletic) legs, don’t even bother. If you’re 5’7″ or taller, and can find a diuretic that can sneak past the WWE Wellness Policy, then you can get a job without displaying any type of outward passion for the sport. Instead, you just have to be able to smile for the cameras and know your role as a woman in a man’s world. If you have thick thighs or natural curves, just forget about WWE altogether. It’s not a wrestling promotion anymore, and it doesn’t bother me. 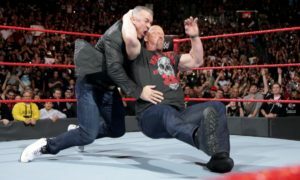 I understand that the entire marketing direction has shifted toward a makeshift Hollywood production, likely what McMahon has wanted all along, and thus the hiring conditions skew more toward superficiality, lest the viewers change the channels at the sight of a love handle or a pasty patch of flesh. It’s this type of direction that excludes a woman like Mickie, who was apparently told by WWE officials that she needed to lose weight. To that, I say to WWE officials, that perhaps they need to spend a couple of minutes in the real world. There’s a reason why guys would rather ‘get freaky’ with someone like Kim Kardashian and not Heidi Montag. It’s why men appreciate the curves of Jennifer Love Hewitt and Christina Hendricks, and are grossed out by the obscenely drugged out Amy Winehouse, or even the Hollywood idealistically thin like Kate Hudson. I truly feel that WWE, in Vince McMahon’s attempt to stray from the “rasslin'” roots and become an accepted part of media elite, has forgotten what’s real. They used to market Chyna as an equality fighter, beating up the misogynistic men who hold down women. They marketed Lita as a rebel, eschewing the normal female role to get down and dirty with the stronger men. They were inspirational because they embodied the qualities that a woman would aspire to have. If I have a daughter, why would I want her to be like Kelly Kelly and Michelle McCool? Sure, she could get by on her looks (assuming the mother is a smokin’ hottie to compensate for me), but if my little girl watched wrestling, I’d want her to emulate Mickie. If my daughter was a great athlete, was beautiful, and displayed a wonderful personality, then she would really be on her way in life. So given the current state of things, I’ll be happy to see Mickie James escape with her dignity in tact, assuming that she’s leaving. I hope she makes it big in Music City, to the point where she, like The Rock in Hollywood, Trish Stratus in yoga and fitness, and even Jonathan Coachman behind his anchor desk, never has to spend another day in the increasingly plastic world of professional wrestling. Besides, can’t you just imagine Mickie James in a cowgirl hat, leather vest, short little Daisy Dukes, and rawhide boots? Visualize that, and imagine her strutting and gyrating on stage or in some country-fried music video. I don’t know about you, but it sure beats the hell out of seeing her put over Michelle McCool.